Now that we've gone from 68 to 16 teams in the NCAA Tournament, there's two ways to look at the field of title contenders we have left. Your viewpoint on the 2019 NCAA Tournament might reflect your outlook on life. You can bemoan a bracket bereft of big-boy upsets or you can celebrate a stacked second weekend. I'll choose the latter. Yeah, it would have been great to see Murray State or UC Irvine or Liberty break through to this Thursday and Friday. Even the small schools in the unusual spot of being well-seeded couldn't win two games. No. 6 Buffalo, No. 7 Wofford and No. 7 Nevada, they are all done and it feels unfortunate not to have at least one of those teams onto weekend No. 2, especially after setting school records for placement and appearances in the AP Top 25. This Big Dance is lacking a little guy in the regional semifinals. That's a bummer. I admit it. March has gone monochrome. As someone who roots for the story, I always welcome in a small-school party crasher because they often give us some of the best the NCAA Tournament has to offer (see: George Mason, Butler, VCU, Wichita State and Loyola-Chicago). But a beefed-up slate of eight Sweet 16 games means a lot of attention and a lot of good hoop ahead. The better the teams the better the basketball. If anything, it's a bit humorous -- basketball gods, what's the message we should be receiving here? -- that the only double-digit seed remaining is No. 12 Oregon. The Ducks were a top-15 team in the preseason and made the Final Four just two years ago. And if you've watched the Oregon over the past three weeks, you've seen a team completely turn its back on the reputation of this year's Pac-12. Dana Altman's got Oregon looking like a Big Ten or ACC team out there. How dare he! The tournament field this year is identical to the Sweet 16 seed company of a decade ago, in fact. A little spooky, even. These are the two most predictable/favorite-laden Sweet 16s ever. You can thank the two schools from the Sunflower State -- No. 4 Kansas State and No. 4 Kansas -- for being the only two teams seeded in the top 16 to fail to break through to the second weekend. Not just that, but the top 14 teams at KenPom are still alive; LSU at 18 and Oregon at 29 are the only ones outside that group. There's other coincidental things coming full circle with 2009 and 2019: that was the only other year a conference put three teams onto the No. 1 line. That season it was the Big East; this season it's the ACC. The national title game in 2009 featured No. 1 UNC over No. 2 Michigan State. Such an outcome is still in play this year. That 2009 tourney was the only other one to have the top three seed lines make the Sweet 16 as well. This year's tournament is just the second in 22 years to see all four No. 2 seeds make it into the regional semis, matching 2009. The '09 bracket's No. 12 seed, like 2019, came from the Pac-12 (Arizona then, Oregon now). And check this trend. Not only is this 2019 field tied for the chalkiest ever up to the Sweet 16 (average seed remaining: 3.1), this year's 16 final teams all hail, with the exception of almighty Gonzaga, from power conferences. You might think this is aberrational, especially on the heels of Loyola-Chicago, but in fact it's not. 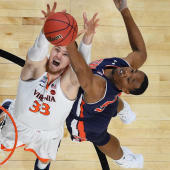 It's the third time in the past four years that the regional semifinals have only been occupied by Gonzaga and teams from the American, ACC, Big East, Big Ten, Big 12, Pac-12 and SEC. If you like your tournaments with chaos, cacophony and a copious contingent of Cinderellas, then the tournament is trending in the wrong direction. But I look at what's upcoming and can't help but be excited. Grieve briefly for those schools that couldn't break through -- and then celebrate the stuffed slate that awaits. We got some drama -- Duke almost lost; that Blue Devils-Knights game is the best of the tournament so far -- and LSU and Tennessee got pushed to near-defeats as well. We've had some awesome moments (Ja Morant/Murray State, Fletcher Magee/Wofford in the first round) and were lightly gifted with a few engaging second round games. But you want more and so do I. Good news: It's practically a guarantee when you check out the goodies on the cupboard for Thursday. The biggest surprise of this tournament so far is its lack of surprises. That in and of itself is a major plot point, one that's giving us assurances of a strong Final Four. In terms of close games and entertainment value, sure, that first weekend has to rate as bottom-five in the 35-year history of the NCAA Tournament in its 64/65/68-team form. But now we have great game after great game coming up. Virginia vs. Oregon is gotta-see-it weird. Duke vs. Virginia Tech in D.C. will be one that has many people picking VT for the upset, especially after what Duke did against UCF. Gonzaga vs. Florida State is a ridiculous game between big, long, athletic teams. Texas Tech-Michigan could be the most competitive game of all the regional semis. Michigan State vs. LSU and Tennessee vs. Purdue set up as high-paced, high-scoring spectaculars. Then you look at the Midwest and see Roy Williams, Bruce Pearl and John Calipari are all involved. With the exception of Kansas not sticking around, this is probably the most attractive set of Sweet 16 games we could have asked for this season. The best is yet to come, and though that's something we always hope for and maybe even say each year with the tournament, this year we absolutely know it to be true. An epic second weekend awaits.